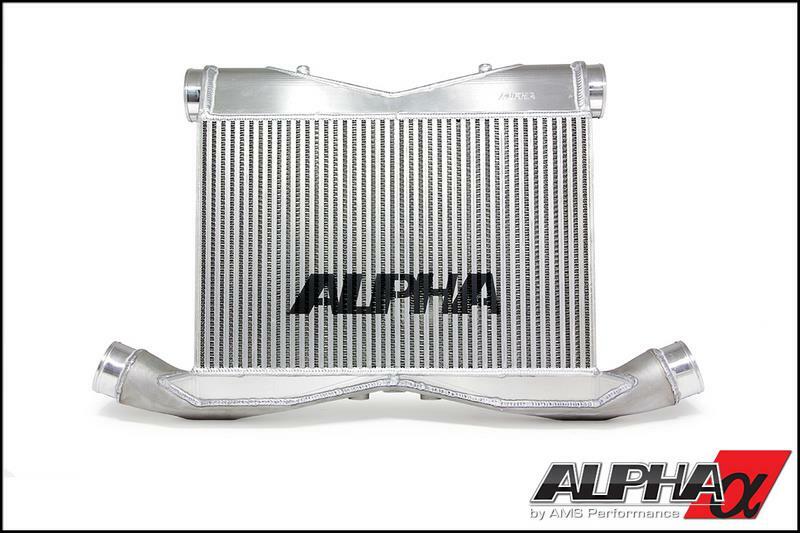 We designed the Alpha GT-R Race Intercooler to be the best-performing, most efficient GT-R intercooler on the market. It certainly had to be in order to meet the requirements of our stable of World Record setting, 8 second Alpha GT-R’s! If your GT-R produces in excess of 900 horsepower or if you drive in a hot weather climate, the Alpha GT-R Race Intercooler is your best option for producing power safely and efficiently. After testing, re-testing and a host of refinements, this race-proven design is perfected and now available for your Nissan GT-R.
At AMS we employ a team of mechanical engineers who have a passion for perfection in form and function. They set out to design an entire package with two goals in mind; maximum power delivery and response with perfect fitment. Every aspect of the project was scrutinized and then optimized to yield the best results. To effectively reduce charged air temperatures, we employed a vertical airflow design for maximum cooling effect with a massive 22”x14”x4.5” bar-and-plate core offering 92.5% more air volume than a stock pair of GT-R intercoolers! The core offers up to twice the fin density of most intercoolers currently on the market. This allows for more contact with cool, dense air and it does so with virtually no boost pressure drop (less than 1 psi) proliferating the most ground pounding power output you can get for your GT-R! Our engineering team designed the Alpha GT-R Intercooler end tanks with extremely smooth features and geometry for the best flow resulting in maximum horsepower. Designed using Solidworks 3D CAD software, these end tanks have improved flow over boxy sheet metal end tanks found on other intercoolers. These large end tanks feature 3-inch CNC billet inlet and outlet ports to provide a smooth, tapered transition from intake to intercooler. Our team went even further by computer designing precisely molded, custom silicone couplers to provide perfect fitment and optimized geometry for improved airflow volume and velocity – providing unmatched power and response. When you buy an Alpha Race Intercooler not only will you get the benefits of unmatched performance and the most well engineered product in its class, we also incorporate the prestigious Alpha logo that peeks out from the front of your supercar. Be warned though, it might scare your competition away!